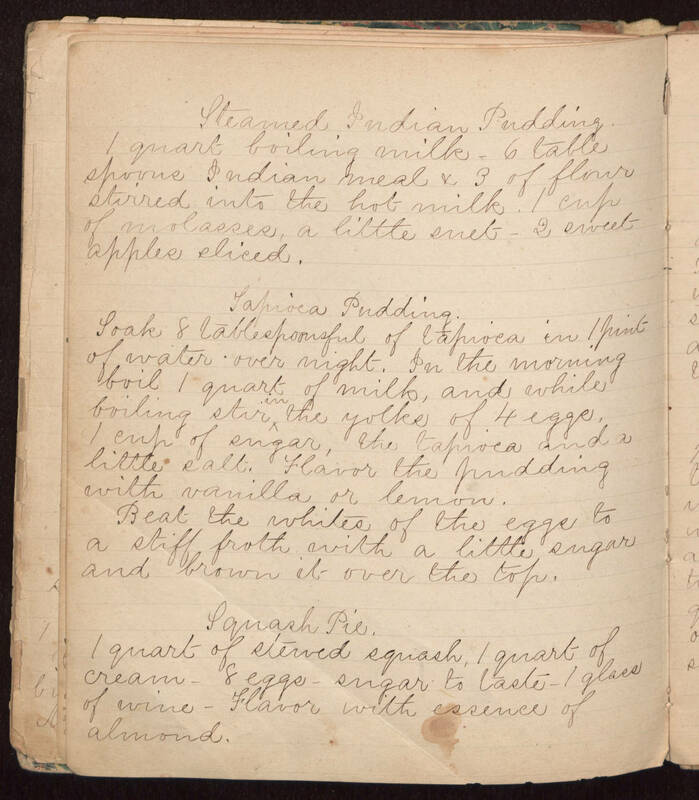 Steamed Indian Pudding 1 quart boiling milk - 6 table spoons Indian meal & 3 of flour stirred into the hot milk. 1 cup of molasses, a little suet - 2 sweet apples sliced. Tapioca Pudding. Soak 8 tablespoonsful of tapioca in 1 pint of water over night. In the morning boil 1 quart of milk, and while boiling stir in the yolks of 4 eggs. 1 cup of sugar, the tapioca and a little salt. Flavor the pudding with vanilla or lemon. Beat the whites of the eggs to a stiff froth with a little sugar and brown it over the top. Squash Pie. 1 quart of stewed squash, 1 quart of cream - 8 eggs - sugar to taste - 1 glass of wine - Flavor with the essence of almond.